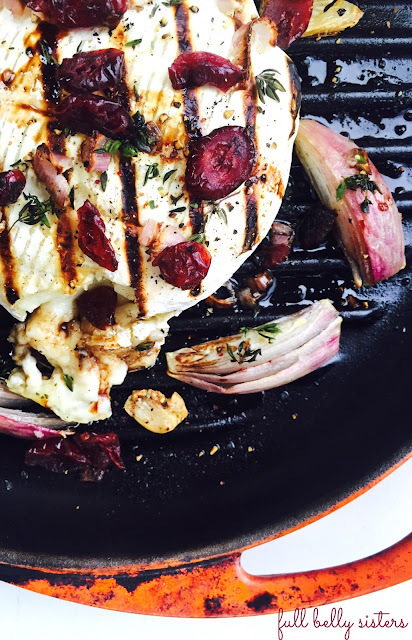 This Grilled Baked Brie with Shallots, Cranberries and Balsamic is warm, creamy, and easy. It will surely impress your guests—but takes only a few minutes and a few ingredients to make! If you follow Full Belly Sisters on Instagram, you'll know that I was lucky enough to attend a party to celebrate Président cheeses at New York City's French Cheese Board. All around me were platters of brie and goat cheese and butter and Roquefort...it was a fromage-lover's dream! 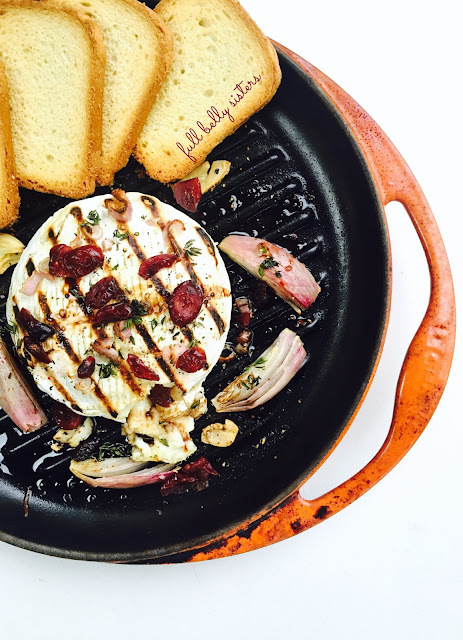 And it was at this event that I first saw a grilled brie—and was inspired to make this Grilled Baked Brie with Shallots, Cranberries and Balsamic. The Président recipe featured plums and saba, a condiment made from grape must. I made my recipe to feature more seasonal (cranberries) and accessible (balsamic) ingredients, but the spirit and flavor of this creamy, easy, delicious dish is intact. I love that this baked brie isn't wrapped up in a pastry. That traditional baked brie is delicious, but it tends to be heavy and I find that the pastry can sometimes overwhelm the cheese. By grilling and then baking the cheese, we can really celebrate the brie—for fewer calories! It's also a nice alternative baked brie for your guests who are gluten-free or grain-free. Preheat oven to 450 degrees. Set an oven-safe grill pan over medium heat and grill the whole brie for three minutes on each side. Remove from stovetop and sprinkle thyme over the brie. Add shallots and garlic to pan and drizzle with olive oil and balsamic, so that they're well-coated. Add salt and pepper. Now you're ready to bake this deliciousness. Grilled and ready to go in the oven! Bake for 10-12 minutes. Remove from the oven and lightly drizzle with some more good, thick balsamic vinegar. Sprinkle the dried cranberries on top. Serve with grilled bread, or thick slices of apple, or—as I did—brioche toasts. Delicious and beautiful, isn't it? The creamy, charred brie pairs wonderfully with the earthy thyme, the roasted shallots, and the sweet-tart cranberries. This Grilled Baked Brie with Shallots, Cranberries and Balsamic would be a simple and stunning appetizer for a New Year's Eve party. But it's easy enough to make anytime you want to indulge in some cheesy deliciousness. Have you ever grilled brie? I was just wondering what I was going to bring to the NYE party that we're going to this week! This looks amazing!!! Great combination of flavors in this dish. I can contest.The brie was delicious and the onions were out of this world. Love the flavors you've incorporated in this Brie, it sounds so good! I love that you got the grill marks on it first. It looks great! What a fun twist on the standard baked brie. I love shallots, and have some on the counter right now. And, I always have balsamic and cranberries. And I grow thyme in the yard. Hmmm, seems I'm just missing one thing! And, I love that you grilled it. So fun! There are so many delicious flavors to enjoy here! This looks so delicious and party-perfect! Mmm, I bet this not only tastes fantastic but smells amazing! Looks just great! I've baked brie en croute but never grilled/baked. Sounds amazing. I like serving brie with pear slices. Delish. This is a lovely presentation of this appetizer! I just want to grab a knife and dig right in. Those grill marks are inspired! I have never grilled a brie, what a great idea for an appetizer! Happy New year to you and yours! I really, really, really love the sound of this recipe so much! I'm salivating here!! We love a great brie appetizer and your combination of sweet and savory and just perfect! Thanks for sharing this one. We make baked brie all the time but have thought about grilling it! So creative, fun and YUM! What a magnificent idea to GRILL the brie! It's a must-make! I saw this one on Pinterest earlier...it looks so good. Perfect for the holiday. 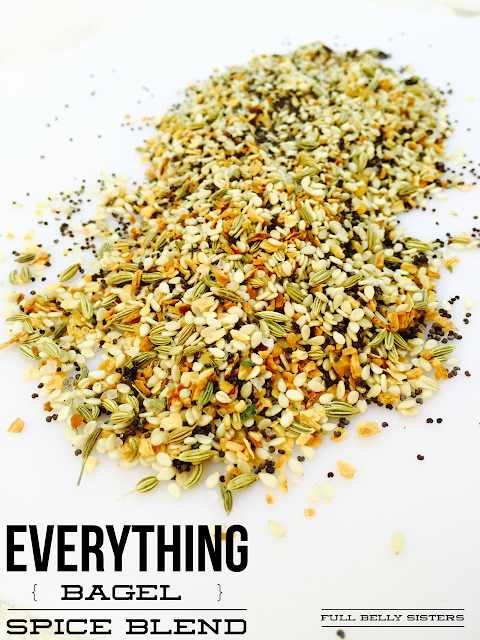 Your recipe looks so delicious, a perfect combination of flavors. Love the combination of flavor going on here. Yum!